Our outdoor basketball courts and indoor basketball courts are perfect for both home and commercial applications, and our athletic sports flooring is designed to reduce stress on joints and provide cushioned comfort. Traction is great and cutting is easy and safe on our regulation size backyard basketball courts and hoops gym flooring. Our courts are perfect for children and teens in the developmental stages as well as adults indulging in the game they love. 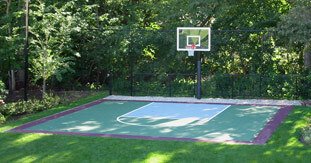 Let Southwest Greens bring the game of basketball to your backyard! Learn more about the advanced features that make our athletic sports flooring the standard for player comfort and performance. Southwest Greens’ backyard basketball courts and athletic sports flooring is built to cushion the impact your joints endure. Once you try our indoor basketball courts, outdoor basketball courts, and multi-purpose gym flooring, you’ll understand why our courts are perfect for both residential and commercial applications. Discover outdoor basketball courts and indoor basketball courts that not only elevate your game but also protect your health. Commercial and residential backyard basketball courts from Southwest Greens are built from a modular surface designed to reduce body stress on those who use them.